One of the first things I do when I visit a new place is to check out the local market. I have to say a recent trip to Barcelona left me disappointed. Rather a lot of salt cod and tired fruit and vegetables. Maybe it was a bad day, but it didn’t bring out the usual cook in me. By contrast, coming home to Nice on the French Riviera was an inspiration. Sometimes you need to leave home to appreciate home. Saturday morning I grabbed my shopping bags (I know that I should paint a scene of Provençal wicker baskets here, but as locals we use plastic reusable Carrefour supermarket bags) and headed for our very local, local market. Every day, except Mondays, stalls set up outside the church square in our neighbourhood, St Roch in Nice. It’s a small city market but it has everything you could want in the way of fresh seasonal fruit and vegetables. It’s a pleasure taking the time to shop like this. The stall owners all want to know what you are cooking, offer their opinion and recipes and always throw in for free fresh bunches of basil, parsley and some lemons. There are bigger markets in Nice such as the Cours Saleya in the Old Town (we leave it to the tourists for most of the year, especially the summer) and at Liberation (a fabulous huge Niçoise market). But we are spoilt having this little one our doorstep. This Saturday I headed home with baby aubergines, sweet tomatoes, glorious peppers (perfect for making the traditional Provencal dish of legumes farci), rose-tinged garlic, fresh salad, roquette, melons, nectarines, flat white peaches (to be eaten immediately with great greedy slurping noises), local olive oil … with, of course, armfuls of the ubiquitous heaven scented basil for a pesto feast. The local butcher is another stopping off point. Seats are placed around the counter as you need to wait and chat, and wait and chat. That’s how it is done here. 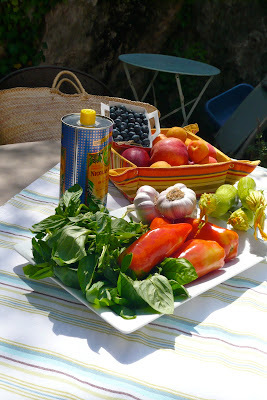 Slow food at it’s best. The outdoor farm chicken I picked out, although thankfully dead, still needed its head and feet cut off, and insides removed (and given to me separately for pâté or to enrich a sauce). The remnants of feathers were then blow-torched. Seasoned inside and out with Provençal herbs and trussed, I finally had my prize. Then there is the boulangerie … but you get the picture. By 12ish you are home having spent 2 hours or so doing the food shopping (3 if you stop for an espresso) and are ready to cook lunch. The phenomenon in the UK, US and other Anglo countries of farmers’ markets doesn’t happen here. 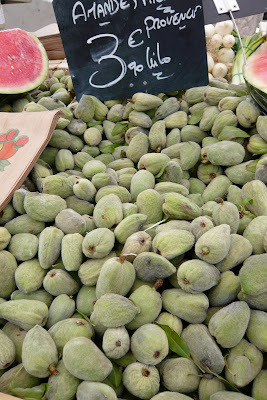 Every market in Nice is a farmers’ market of sorts. It is a way of life in the South of France, even in the cities. It’s a manner of shopping that takes time and couldn’t be more enjoyable. If you are visiting the Côte d’Azur, there will be a market near you, so please do get up early, grab your plastic carrier bag and check it out.